Webb Simpson Wins U.S. Open; Miami Heat Takes 2-1 Lead In NBA Finals : The Two-Way The 25-year-old Simpson won the first major golf tournament of his career. Meanwhile, LeBron James led the Heat past Kevin Durant's Thunder. LeBron James of the Miami Heat as he went to the basket against the Oklahoma City Thunder during Game 3 of the NBA Finals on Sunday in Miami. -- Golf. Webb Simpson won his first major golf tournament, outlasting Jim Furyk and Graeme McDowell to take the U.S. open title on Sunday at The Olympic Club in San Francisco. He finished the Open at 1-over par. As ESPN writes, the 25-year-old Simpson triumphed because of "four birdies in a five-hole stretch around the turn, and a tough par from the collar of the 18th green. ... Furyk bogeyed two of his last three holes, and McDowell couldn't recover from a bad start and too many tee shots in the rough." For those who keep track of Tiger Woods, he finished back in the pack at 7-over par. The full scoreboard is here. On Morning Edition: Linda Wertheimer talks to USA Today sports columnist Christine Brennan about the Open. -- Basketball. The Miami Heat, "took a 2-1 lead in the NBA Finals with a 91-85 victory over the Oklahoma City Thunder on Sunday night" in Miami, as The Associated Press writes. 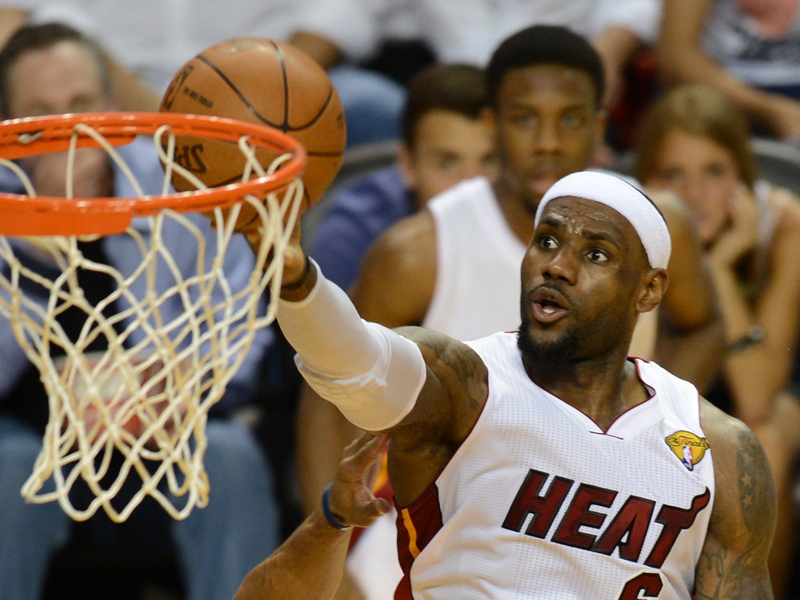 LeBron James led the way for the Heat with 29 points and 14 rebounds. The full box score is here. Game four, also from Miami, is set for Tuesday at 9 p.m. ET. ABC-TV is the broadcaster. It's a best-of-seven series. On Morning Editon: Mike Pesca reports from Miami.